I love having friends and family over for the holidays; it is a wonderful time to catch up on everyone's latest happenings and celebrate one another's successes. 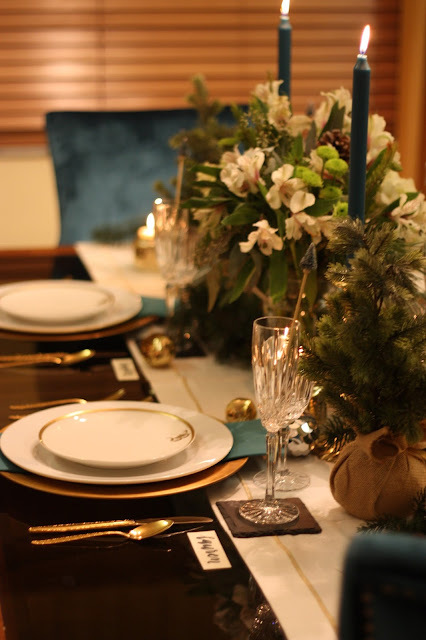 Each year I like to come up with a creative and beautiful tablescape for entertaining, and this year I was inspired by the shades of the forest, evergreens, juniper, teal, neutrals, and hints of gold. 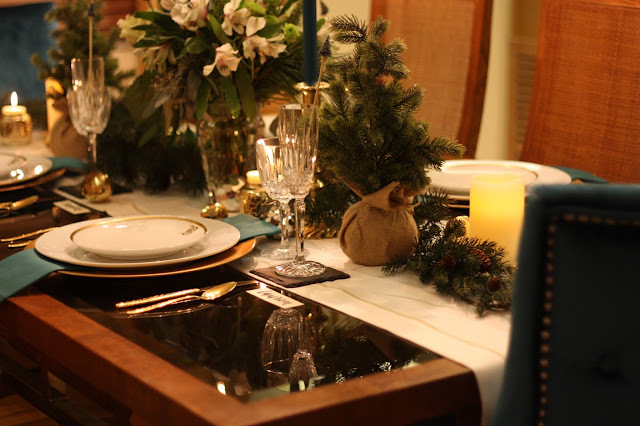 After creating the perfect invitation with Paperless Post, I got to work creating a table setting that reflected the lovely design. 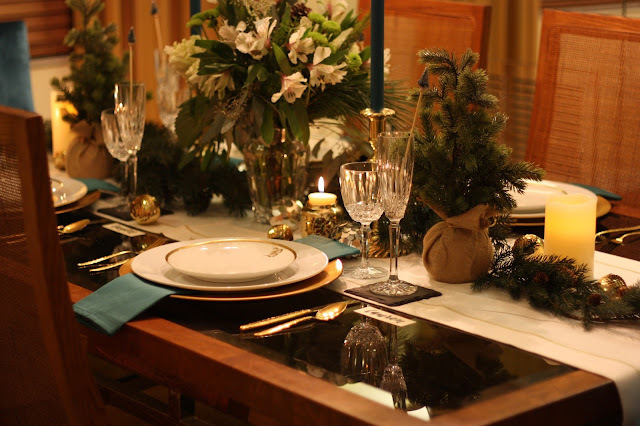 I began with a simple white and gold runner, small pine saplings, and layered in a few candles at different heights to add extra light and interest. Tall teal taper candles and a big bouquet of white blooms mixed with pine branches created the perfect finishing touch to the minimalistic, elegant feel. 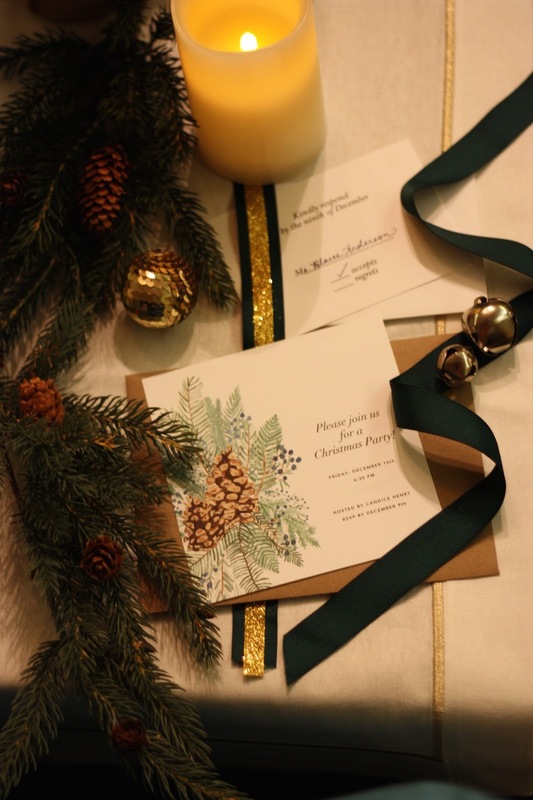 Guests always appreciate the thoughtful attention to detail, and a special hand-lettered place card marked each person's seat. 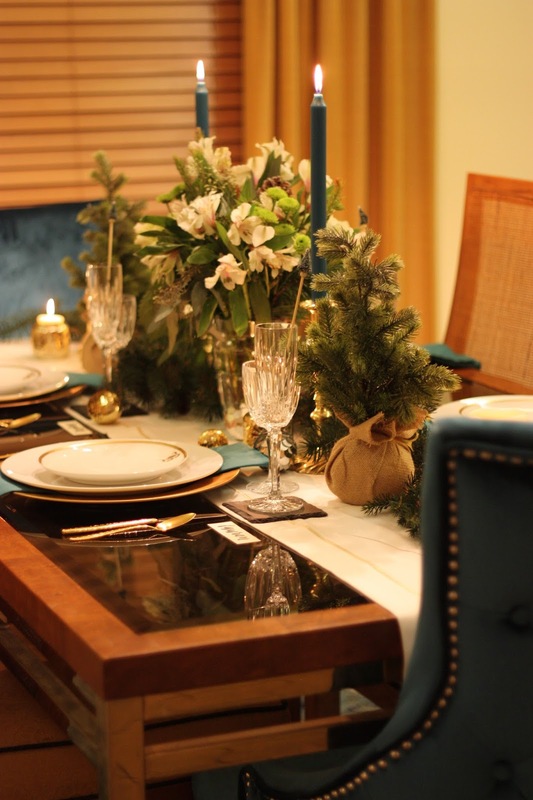 When setting the table, I like to take into consideration where guests should sit, and will often seat people by those with whom I think they will connect with. 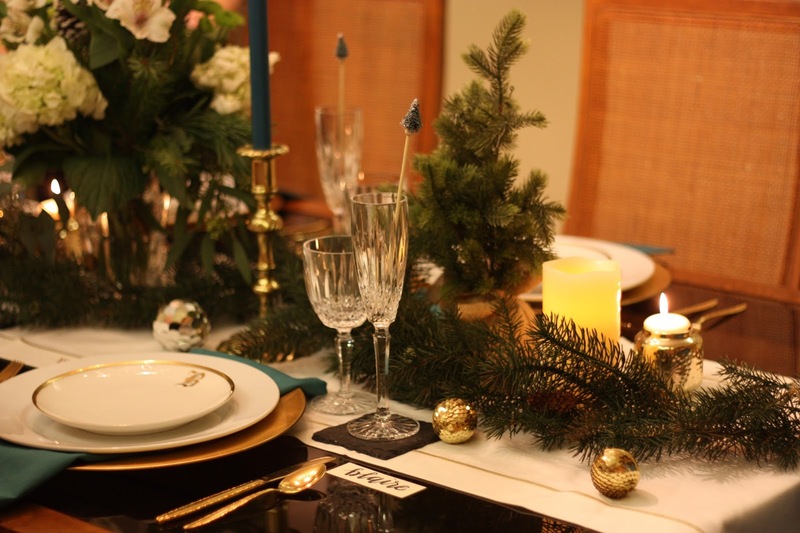 Gold flatware and chargers are some of my most well-loved and highly complimented items in my entertaining arsenal, and this time I added on classic white dinner plates and a special set of gold-rimmed dessert plates that belonged to my great aunt. 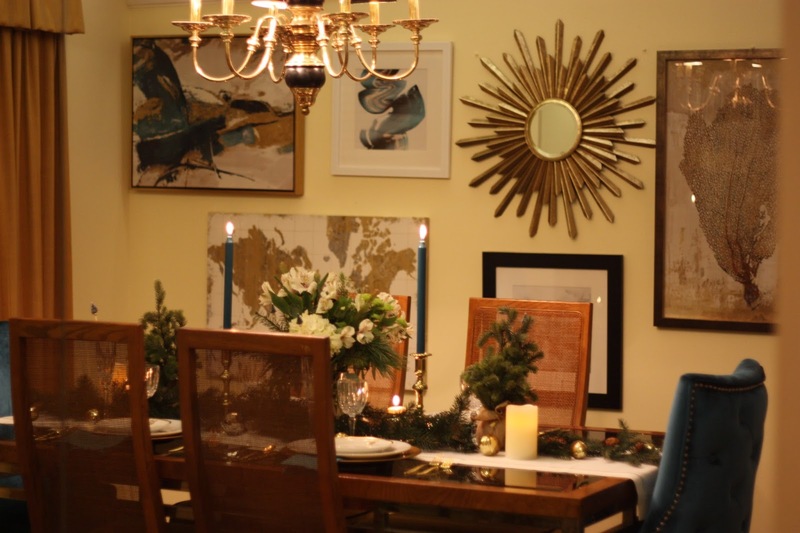 It's such fun to add in special touches of heirloom pieces or little details that are meaningful to you, and it often prompts great storytelling when inquiries are made about various pieces! 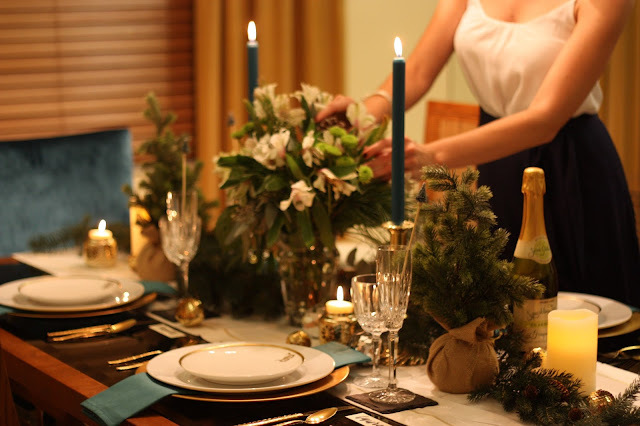 After the food has been served and toasts have been made, I always love taking a moment to look around the table, listening to stories being told and laughter being shared. Time spent together around this season is simply the best! After all, there's no place like home for the holidays!